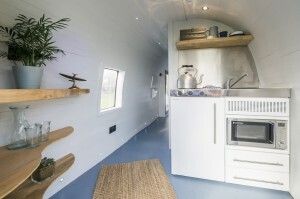 A 1000mm compact kitchen from Elfin Kitchens has been installed in an innovative new holiday rental home, which recently featured on Channel 4’s ‘George Clarke’s Amazing Spaces’. 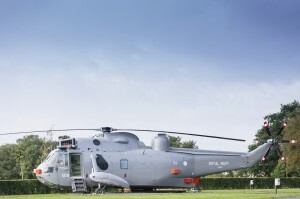 A converted Sea King helicopter now offers accommodation for a family of five, with Elfin’s white steel kitchen supplying full cooking, refrigeration and storage facilities for guests. 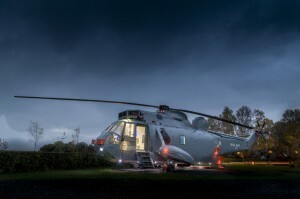 The conversion of the Sea King was undertaken by Stirling-based farming couple Martyn and Louise Steedman, after purchasing the aircraft in an online auction. 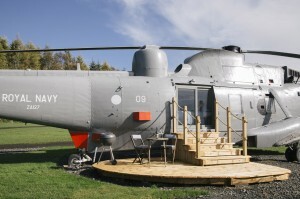 It now takes pride of place at Mains Farm Wigwams in Stirling, Scotland. 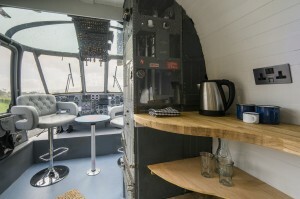 The new compact kitchen – which sits in a space previously occupied by the sonar station – was chosen for its ability to supply a range of functions in a restricted space. Two solid hotplates offer simple yet effective cooking, with a built-in 30-minute safety cut-out timer for added safety. The kitchen’s integrated A+ rated Liebherr fridge with internal freezer compartment delivers ample cold storage, while a 20L Russell Hobbs solo microwave allows guests to prepare hot food. Furthermore, two integrated drawers are included for dry food storage, with a stainless steel sink, drainer and tap allowing guests to keep crockery and cutlery clean throughout their stay. Starting at 900mm wide up to 1500mm, compact kitchens from Elfin save space and offer great flexibility with right or left-hand versions available, as well as hotplates, dishwashers, combi-ovens and additional storage units.